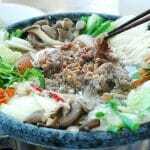 Bulgogi (불고기) is always wonderful grilled over an open flame or pan fried, but try making it into a hot pot (jeongol, 전골) with lots of vegetables. It becomes a whole new dish that’s hearty, steaming, and flavorful. Perfect for the cool fall and winter months! 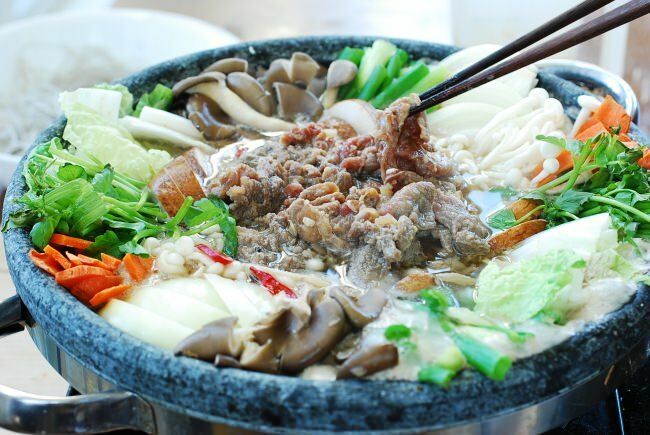 Jeongol is a type of Korean stew with many variations such as haemul (seafood) jeongol, beoseot (mushroom) jeongol, mandu (dumplings) jeongol, etc. 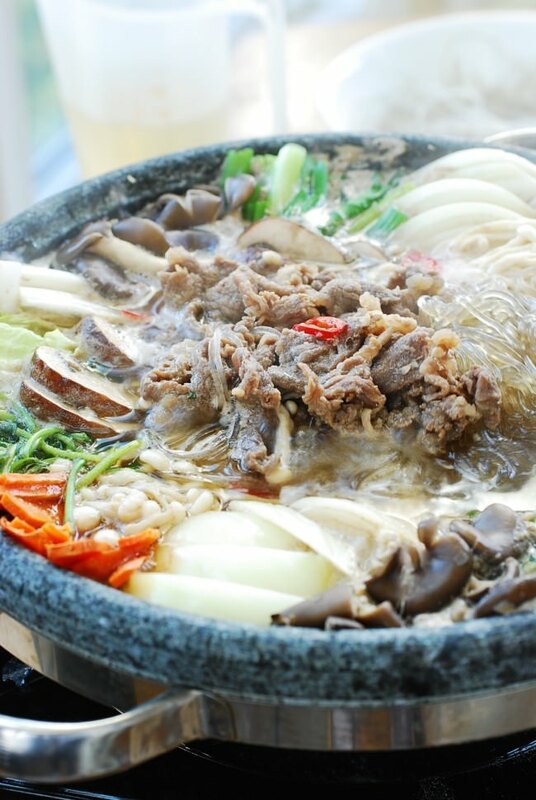 It’s an elaborate stew which is traditionally served in a wide, shallow pot called jeongol naembi (전골냄비). Making bulgogi jeongol is fairly simple! 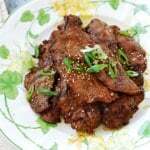 First make bulgogi by marinating thinly sliced beef. It’s even better if you have leftover bulgogi. 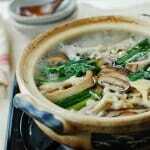 Then, arrange a variety of fresh vegetables and bulgogi in a shallow pot, add some broth (or water), and cook. 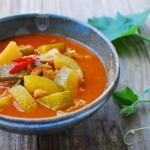 Depending on the size of your pot, you can cook in two batches, or you can add more ingredients as you cook, or take some out to eat if you’re cooking at the table. You can certainly feed more people this way. One pound of meat will go a long way! I like mushrooms so I usually add plenty of them – two to three varieties. I also use a couple of napa cabbage leaves. Green cabbage or bok choy will be great as well. Other add-in options are bean sprouts, radish (mu), and tofu. Sweet potato starch noodles (dangmyeon, 당면) is also commonly added to this dish. The noodles are so good after soaking up the flavorful broth. Bulgogi is sweet, so I don’t add sugar to the broth. 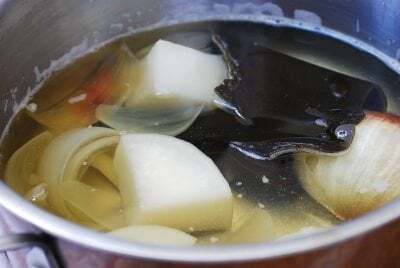 The sweetness that the bulgogi releases makes the broth slightly sweet, not too sweet, but if you like it sweeter, add a little bit of sugar to the broth. The beautiful stone shallow pot (jeongol naembi) shown in the photos of this post is sponsored by Stone Lee (Youngshin Stone Co.) in Korea. The company has been producing stone kitchenware for over 20 years. They use Jang Su Gob Dol (Korean Amphibole) to make more than 100 stonewares such as bowls, pots, roasting pans, etc. This material has high heat conductivity and minimizes the loss of the nutrients of the ingredients being cooked in. 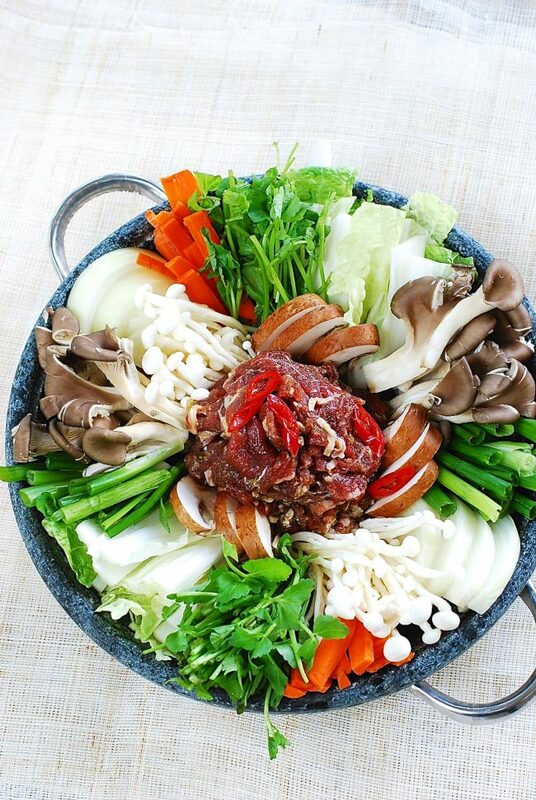 A Korean hot pot made with sweet and savory bulgogi and lots of vegetables! 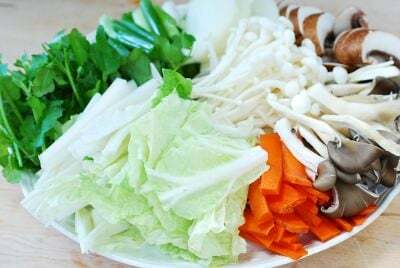 4 ounces assorted mushrooms button, shiitake, oyster, crimini, enoki, etc. Mix all the marinade ingredients in a large bowl. If using packaged pre-sliced meat, run a knife through it to cut into smaller pieces. Add the meat to the marinade. Toss gently, with hands, to mix everything well. Marinate while preparing the other ingredients. Put 5 cups of water and the broth vegetables in a medium size pot. Bring it to a boil over high heat. Reduce the heat to medium and continue to boil for about 15 minutes. Discard the vegetables. Season with the soup soy sauce, salt and pepper to taste. Cut the cabbage and carrot into thin, bite size pieces. Thinly slice the onion and mushrooms. Cut the scallions and minari in similar lengths. 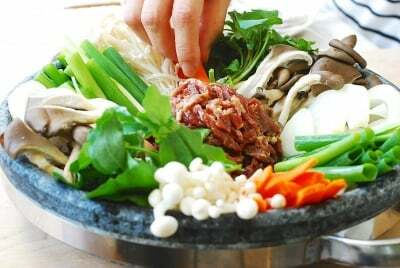 Using a wide, shallow pot, neatly arrange the bulgogi and vegetables in clusters. Add the optional noodles. Pour in 2 to 3 cups of broth and cook over high heat, separating the bulgogi pieces. 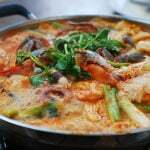 Depending on the pot size, you can cook in two batches or add more broth and any remaining ingredients while eating if you’re cooking at the table. 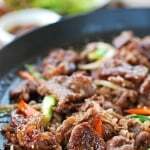 If you buy pre-sliced bulgogi meat, pay a little more to get good quality meat. If cutting the beef at home, partially freeze for about an hour to firm it up for easier slicing. Cut across the grain into very thin slices. 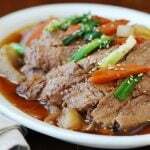 You can use any type of broth (beef broth, anchovy broth, etc.) or simply use water. This looks delicious! I would like to try making it soon. However, will you please clarify: what is soup soy sauce? Looking forward to hearing from you and tasting this stew! Thank you for the clarification! 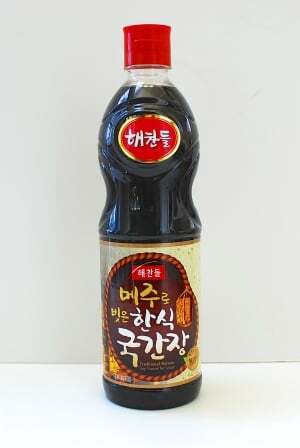 I’ll look for it at the Korean market. Can’t wait to try it! Keep up the great work. I love your recipes! Hello! Looks so yummy! Which version of the pot is this? Their website has a lot of different kinds. Thanks! Thank you so much for this great recipe, I was wondering what dipping sauce should I make? Or do I not need one? Thanks so much! 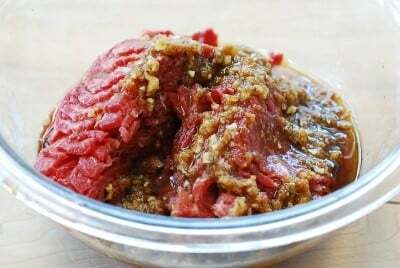 Bulgogi is marinated before used in the hot pot so it’s very well seasoned. You really don’t need a sauce for this. 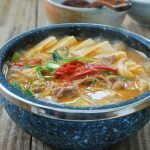 Hyosun – awesome recipe – can you add a recipe for bul-nak jeongol as well? Or is it as simple as adding marinated nakji to the pot (marinated with gochujang/gochugaru/garlic/etc)? Thanks! Hello, I would like to purchase this but haven’t been able to locate it online. Is there a place in VAor MD that carry these? Thank you in advance! 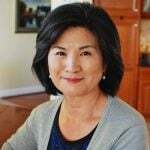 Check with Lotte or Home store in Centreville by the Spa.